Xi Jinping has arrived in Russia on the first stop of his maiden overseas tour as president of China. 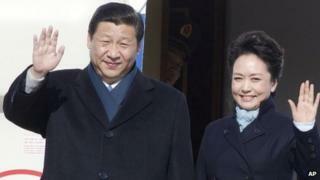 Mr Xi is set to meet Russian President Vladimir Putin, with the two likely to discuss energy and investment deals. Speaking ahead of the visit, Mr Xi said the two countries were "most important strategic partners" who spoke a "common language". He will also visit Tanzania, South Africa and the Republic of Congo on his tour, which continues until 30 March. In South Africa, he will attend the fifth Brics summit from 26-27 March. Brics stands for Brazil, Russia, India, China and South Africa - five key emerging economies. Mr Xi's wife, well-known military singer Peng Liyuan, is with him on this trip. The choice of Moscow as Mr Xi's first destination is seen as symbolic, and a move from China to counter the US pivot to Asia, correspondents say. Russia is one of the world's biggest energy producers, and China is the world's top energy consumer. Bilateral trade is booming, reaching a record $88bn (£58bn) last year. Beijing and Moscow have held similar positions over a number of thorny diplomatic issues, from Iran to Syria to North Korea, and some analysts suggest the bond is likely to strengthen. At a press conference, Mr Xi called Russia China's "friendly neighbour", and said that the fact that he was visiting so soon after assuming presidency was "a testimony to the great importance China places on its relations with Russia." "China-Russia relations have entered a new phase in which the two countries provide major development opportunities to each other," he said. In an interview with Russian press, Mr Putin said that Russia-China co-operation would produce "a more just world order". Russia and China both demonstrated a "balanced and pragmatic approach" to international crises, he said. In an article in 2012, the Russian president had called for further economic co-operation with China to "catch the 'Chinese wind' in [its] economic sails". China is also Africa's largest trading partner, surpassing the United States and its traditional European partners. "China-Africa co-operation is comprehensive," Mr Xi said. "It has contributed to Africa's international standing." Xi Jinping was confirmed as China's president last week, concluding a lengthy transition process that saw him assume the Communist Party leadership in November 2012.